Each One Eye piece is handmade in Philadelphia. Made from porcelain and stoneware and fired in an electric kiln, most pieces are food, dishwasher and microwave safe but, if not, it is noted in the description of the piece. For best results, hand wash your One Eye pieces. Because these pieces are made from scratch, please allow 2-4 weeks for shipping if the piece is in stock. For custom orders, allow 4-6 weeks for arrival. Each piece is one of a kind and thus may arrive with slight variations and differences (but that's the fun part!). For custom orders and other inquiries, please email through the contact page. 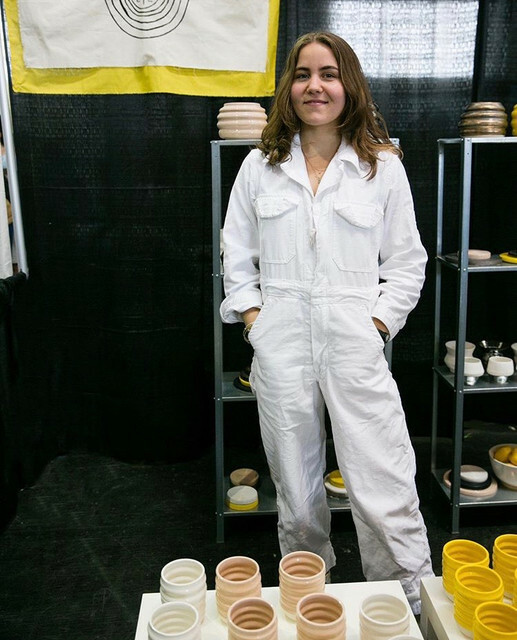 Originally from Portland, OR, Louise Sullivan now lives in Philadelphia, PA. She has been making ceramics since she was nine and continues to love the process. Right now, she makes ceramics, works at a store, and teaches first graders. She has always loved eye imagery, drawing and sculpting eyes when she was little and was very excited to find out that one translation of her last name is "one-eyed."